Serenity Upwind Kayak Sail and Canoe Sail Kit (Red). Complete with Telescoping Mast, Boom, Outriggers, Lee Boards, All Rigging Included! Compact, Portable, Easy to Set up - Makes a great gift ! View More In Kayak Hardware. Enjoy the fun and serenity that is sailing! Turn any old kayak, new Kayak or Canoe into the hottest thing on the water. 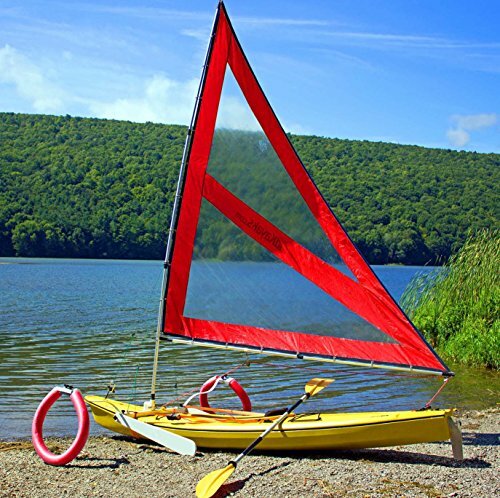 With special outriggers and leeboards, this sail kit will let you sail even into the wind! Turn heads and make new friends with this unique new Kayak and Canoe Sail kit. Mast extends to 12 feet high and with large 40 sq ft sail enjoy free, unlimited (green) energy now! Makes a great gift! Compact and portable, straps on to virtually all Kayaks AND Canoes! New design allows you to paddle normally when there is no wind. With telescoping mast and boom, folds to fit inside your car and weighs under 22lbs complete! If you have any questions about this product by Sailskating, contact us by completing and submitting the form below. If you are looking for a specif part number, please include it with your message.